There has been much controversy lately with Hazina, the Telus Hippo. After performing in the very popular Christmas commercial for high speed internet TV, Hazina was paid the hefty sum of $10.000.00 with the promise that it would contribute to the fund for her new home. To no avail. Hazina is still living in apparent squalor and the zoo is now facing criminal charges. She lives in a windowless concrete shed with a pool that is too shallow to allow herself to be entirely submerged. Lucky for Hazina she is a big TV star that has fans and spokespeople. If Hazina wasn’t a public figure would people still make it their mission to look out for the best interests of animals in advertising? What about animals owned by individual people instead of organizations? Who looks out for them? Is it ethical that the animals are doing all the work but the human reaps the benefits? In Hazina’s case, although there has been a very long delay, she is benefiting from the work she performed. But does she even know or care? Come on out this Friday to Fight Leukemia in a carnival of fun and madness. $10 at the door, includes a free drink before 10. 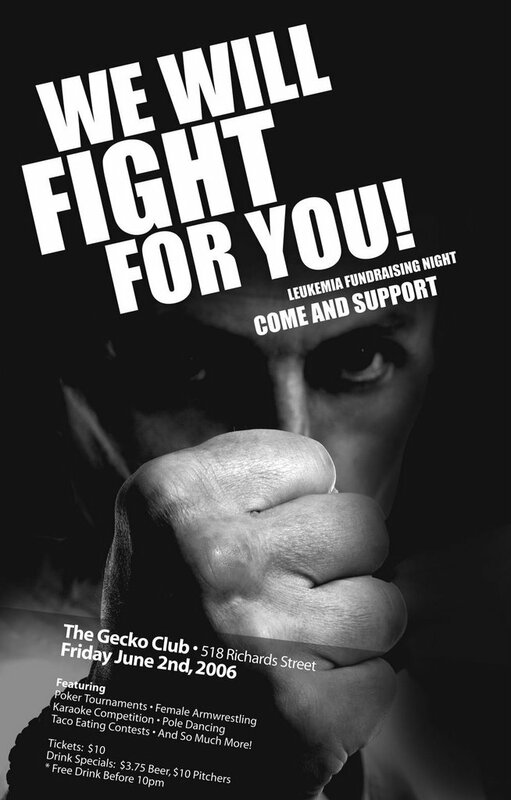 Help support Mike and Maria's quest to raise $11,000 for leukemia, lymphoma and Hodgkin's Disease. We are at $7500 now, with only 3 weeks and $3500 to go!